If you are aspiring to bring a little bit ofFrench decor into your home, it’s pretty easy to do in small ways. and desperately needing an update! It’s amazing what paint and upholstery can do in updating a piece. If you are worried about the upholstery part, then a footstool is the perfect piece to get started with! We recently found several different footstools while out junking at some of our favorite flea markets. All were different sizes, but they all had the “french” look with their curvy legs! Curvy legs is a requirement of mine…….not really interested if they don’t have some curve! They were all in different stages of neglect with the most obvious being the really old fabric that they were covered in. Unfortunately, I didn’t get pictures of the before, but trust me, they weren’t pretty! The first thing I did was strip the old upholstery off and saved it so that I could use it for a pattern. Then I painted the wood in Annie Sloan chalk paint…….Old White…….my favorite paint, because it is so forgiving and will cover anything with no prep! After distressing and waxing, it was time for the upholstery. 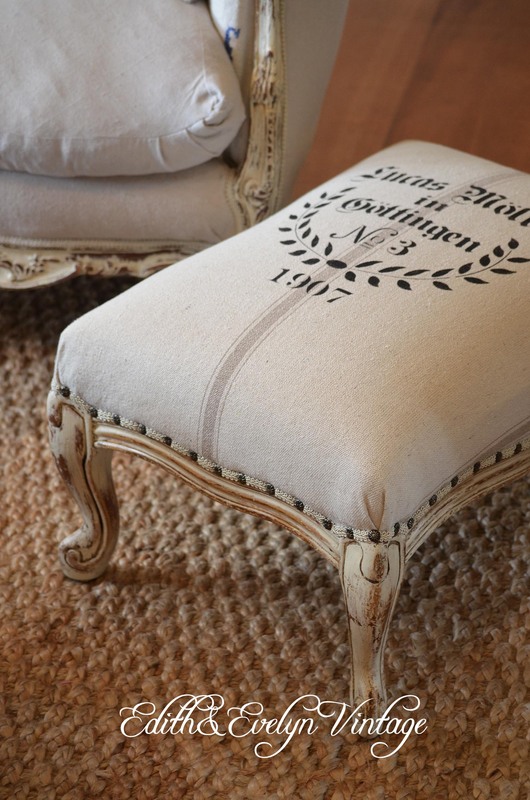 I love, love,love, using antique European grain sacks in upholstery projects. It’s the perfect weight and texture. The grain sacks with graphics are especially a weakness for me! Unfortunately, they are also the most expensive. But it is very easy to get the look without the expense! I have stacks of the plain European grain sacks, which are pretty easy to find on Etsy and Ebay. You know the ones with the beautiful, colored stripes down the center? You could also make your own “faux” grain sack using Lowe’s drop cloths and stencil the stripe on. If you aren’t using Lowe’s drop cloths for a million different projects…….then I don’t know where you have been! But that’s a whole other conversation! My grain sacks that I used didn’t have graphics, so I added them. I ordered the stencil from a wonderful Etsy shop, Euro Stencil Designs. You can find her at www.etsy.com/shop/EuroStencilDesign. She has lots of stencils to choose from! I love the old German grain sack graphics with the farmers name and the dates. So those are the ones I ordered. Using the old fabric cover for a pattern, I cut out my new cover from the grain sack, and stenciled the graphic on with black craft paint. Be sure your graphic is centered on the fabric. Fit it to the top of the stool, turn under and staple with a staple gun to the underneath side or to the sides as in the larger footstool. With the larger stools, we added a complimentary trim to the edge to hide the stapled edges. You can add the trim by using the good ol’ trusty glue gun! And for an extra pop, we also added nail head trim to some of them. I love how they turned out and they give you an instant piece of old world “frenchy” charm without a lot of expense! They are also small enough that they can be used in so many rooms and different ways! These are the same paint and grain sack techniques that I am using in re-doing my French dining room chairs. The footstools went into the shop to sell, so if interested, check them out! « What is Wrong with People?!? Just found you on home talk! I love these! Thank you for sharing! I would love for you to come link up to my Furniture and Paint Party every Thursday!